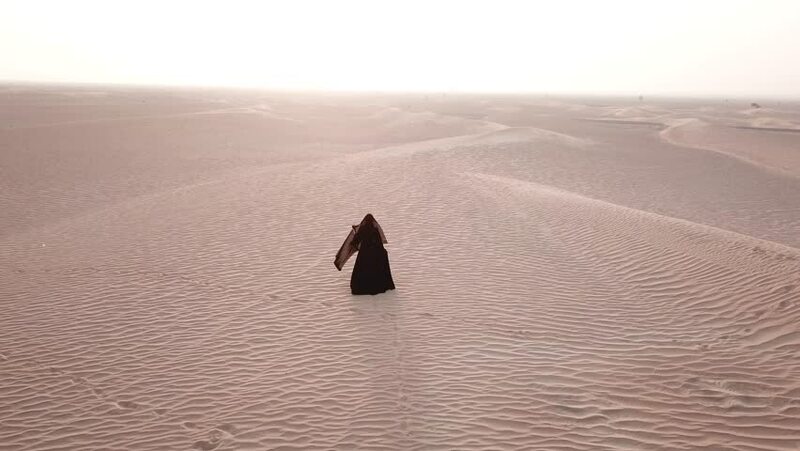 A woman in abaya (United Arab Emirates traditional dress) walking on the dunes in the desert in bright morning light towards the sun. Dubai, UAE. 4k00:25A woman in abaya (United Arab Emirates traditional dress) walking on the dunes in the desert towards the camera and then passing it while camera turns to follow. Dubai, UAE. 4k00:14A woman in abaya (United Arab Emirates traditional dress) walking on the dunes in the desert as viewed from the side. Dubai, UAE. 4k00:30Aa woman in abaya (United Arab Emirates traditional dress) walking on the dunes in the desert towards the rising sun. Dubai, UAE. 4k00:19Aa woman in abaya (United Arab Emirates traditional dress) walking on the dunes in the desert with drone following it while reducing height and distance. Dubai, UAE. 4k00:18Aa woman in abaya (United Arab Emirates traditional dress) walking in the desert with smooth dawn light, as viewed from the back. Dubai, UAE. 4k00:34A single woman in abaya (United Arab Emirates traditional dress) walking on the dunes in the desert towards the sunrise bring light. Dubai, UAE. hd00:17Young happy couple running on the beach on the sunset. Concept of love and relationships slow motion.